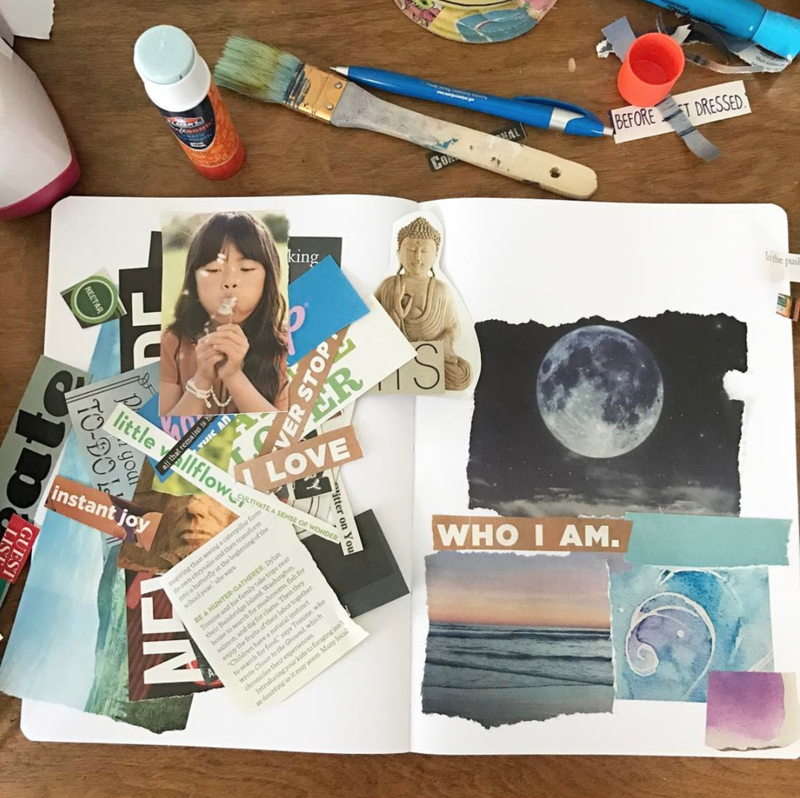 Come along for 21 days of collaging, journaling, and connection to help you tell your story. Because playing with scissors and glue and images and words connects us to the creative joy inside us. Because honoring and telling our stories helps us push through the stacked up stuff so we can fully show up in our lives. 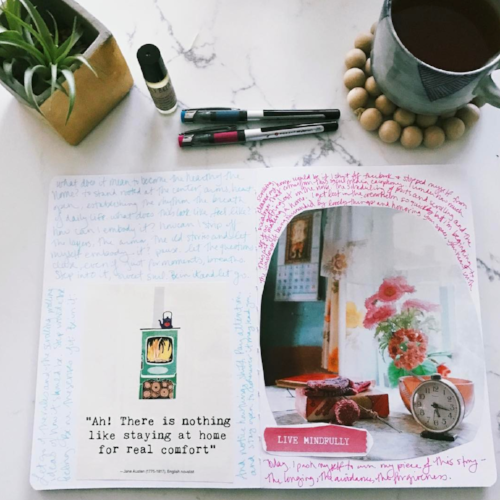 Tell It: Collage is an ecourse that uses the mediums of collaging + journaling (plus a big dose of inspiration and connection) to help you tell the stories waiting inside you. And it connects you with a community of kindred spirits who are each finding their way to telling their stories every single day. Here's how it works: You'll gather up a journal and magazines + glue + scissors + pens + whatever other supplies you feel called to play with right now. I'll provide prompts, stories, inspiration, and tips. And then we’ll meet in a private Facebook group and on Instagram to share our stories and creations each day. I'll also share peeks inside my journals and how this practice has helped me deepen my relationship with myself, others, and even give me direction with my dreams and business. Course material delivered by email: Daily emails will include creative prompts and ideas plus stories from my creative adventures with my Tell It: Collage journal. There will also be self-care ideas, mindfulness practices, and other inspiration sprinkled in throughout the course. Note: Most emails will be prompt based but there will be a few sprinkled throughout that will give you some breathing space for whatever you need: catching up or going deeper or taking a break. Facebook group: We'll have an optional private Facebook group where we can share what we create, connect, and support one another. Instagram: We’ll also connect on Instagram via a hashtag, which is a fun and easy way to share and meet others in the course. Because the act of flipping through magazines to gather images creates a rhythm that gets you out of your head and back into your body. Because this is a creative self-care practice you can do with minimal supplies almost anywhere. Because pasting image and words give you a place to begin to tell your story - no more staring at the blank white pages in your journal unsure of where to begin. Read about my favorite supplies. How is this different or similar to Tell It? Tell It: Collage is a new course in the Tell It series, and I'm so excited to share it with you! The intention behind these courses is to support you in creating self-care practices to help you tell your stories through different creative mediums. Tell It: Collage focuses on the medium of simple collage techniques and journaling. So is this a technique course? No. While I will share some tips and a look at how I use collage to tell my stories and journal, this is not a course about mixed-media collaging or other kinds of techniques. Do you need to know how to collage or have experience with journaling? What if you're not an artist? All are welcome! This course is about helping you create space for you to get to know yourself better while connecting with your creative side and kindred spirits. And I bet you know what I'm going to say next: Everyone is an artist. And what I love about this course is how it connects us with our younger selves who loved simply creating for fun. Check out my favorite supplies here. Is this the same course you taught for the last round of Tell It: Collage? Yes! While I update my courses a bit each time I teach them, the main course content and prompts will be the same. The previous round had a breathing space week in the middle and this round will instead have "breathing space days" inserted a few times throughout the course so you can catch up on prompts or play in your journal in the ways that you want to.